It’s dumb mistake that almost all elected officials succumb to at one time or another, but with a relatively experienced politician like Thom Tillis, you think he’d already know better. Unfortunately, it looks like North Carolina’s junior senator will have to learn his lesson the hard way. 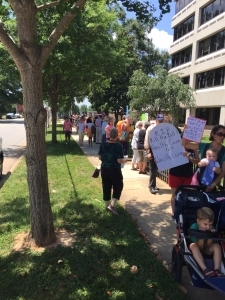 Instead of simply receiving — and maybe even, God forbid, patiently listening to — the heartfelt pleas of the assembled activists who braved the heat and humidity to turn out for the umpteenth straight Tuesday, Tillis’ people called out the security and the yellow police tape to keep constituents away. Click here to listen to a very nonthreatening protester named Michael Eisenberg explain in a Facebook video how he was denied the opportunity to deliver a letter to his senator. The bottom line: Today’s protest was another all-American, wholesome-as-apple-pie effort by an incredibly earnest and caring group of citizens — many of them grandparents and moms with kids in strollers. 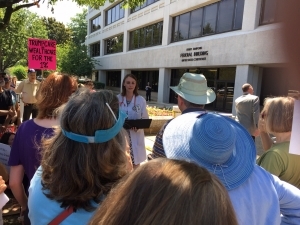 The featured speaker, Orange County physician Erica Pettigrew, gave a fabulous and heartfelt description of some of her struggling clients who would be grievously harmed by the U.S. Senate’s Trumpcare proposal. It’s simply outrageous that Tillis and Richard Burr will not even meet with and listen to such loving and intelligent people. Unfortunately for Tillis (and fortunately for the growing movement against his policy positions), today’s boneheaded decision to shut the protesters out and treat them with such little respect all but guarantees that more and more people will be heeding future protest calls. Stay tuned. There may be a time in the not-too-distant future in which Tillis looks back longingly on the 29% approval rating he enjoys today. I was there today. I have copies of the letters with original signatures that the staffers simply refused to accept. It is being held for the next protest, but I am happy to share. In Washington DC the offices are come as you are. Anyone can enter. There is an in box. It is absurd that they would refuse to take signed letters. You were elected to represent the citizens of North Carolina, not those who contributed to your campaign! This healthcare bill is a disaster for seniors, the needy, women and those with health issues! Please do the honorable thing and take care of those in our state who NEED good health care! How can you sleep at night if you support a bill that causes suffering and even death? Senator Tillis, my understanding is that you profess to be a Christian. As a pastor, I read Christ’s word to feed the hunger, welcome the stranger, and heal the sick. Can you please explain how you and we together can do that for our fellow men and women in NC? If not, please do not call yourself a follow of Christ.. I.e. A Christian. A true public official would allow people to visit and exchange the values which his/her district believe to be of value. As a person who is running for a federal office, I will always maintain an open door policy where you will be always welcome to express your values. I was there yesterday to speak for the people who can not speak for themselves. When I was told that I could not enter the federal building named after a great North Carolina statesmen I was hurt, then became angry and disappointed that a man Sen. Tom Tillis would restrict his office to people who want only simple things like a flag, pin or tour of the Washington DC world. This is how it started in Germany many years ago. Senator Tillis – remember you work for us! Nothing like a politician who fears the constituents and won’t listen to or read their letters! What arrogance! YOU ARE NOT THE GOVERNMENT AND IT DOES NOT BELONG TO YOU. THE PEOPLE ARE THE GOVERNMENT AND IT BELONGS TO THEM/US. desperately worried about all of our grandchildren. You are a fool… a puppet on Pmurt’s string, obviously! Malice, Cruelty & Divisiveness in legislation that harms the public will cost you! & all to work a vendetta against our last President! The people will be heard! You will be voted out of office! Your work will be undone with new and reasonable legislation… just as you in Congress are doing to the Obama legacy. Pity, though, the costs to the people, in money, time & wellness… lives will be lost! How do you sleep at night or look at yourself in the mirror?